Adding to a strong community effort to spread messages of education, health and sustainability, AMSOIL Arenacross riders visited Lighthouse Charter School’s 150 elementary students on Thursday. Comparing bodies to bikes, the riders discussed their own experiences of how eating healthy, being active and taking safety precautions prepared them to become riders for Arenacross. Gared Steinke, professional Arenacross rider from Woodland, shared how he was inspired to ride dirt bikes professionally at a young age. He began a regimen that included eating more servings of fruits and vegetables, running around his neighborhood and always wearing a helmet when riding his bike. Joining Steinke in the presentation was amateur rider Antonio Calavano. The Sacramento native detailed his experiences growing up in the area and how seeing Arenacross at Sleep Train Arena inspired him to one day join the tour. 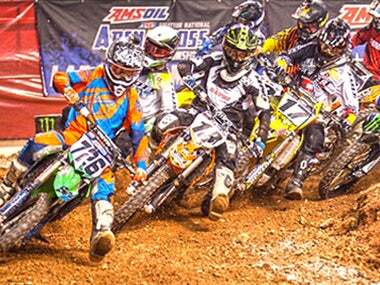 Arenacross takes over the Golden 1 Center this weekend—Saturday, April 1 and Sunday, April 2.